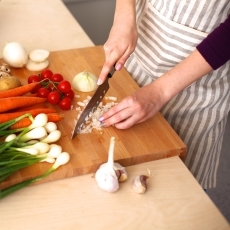 Clean - always wash your fruits and vegetables, hands, counters, and cooking utensils. Separate - keep raw foods to themselves. Germs can spread from one food to another. Cook - foods need to get hot and stay hot. Heat kills germs. Chill - put fresh food in the refrigerator right away. In the grocery store, avoid cans that are bulging or jars that have cracks or loose lids. Check packages to be sure food hasn't reached its expiration date. Article: Emerging Point-of-care Technologies for Food Safety Analysis.